With the 2012 F1 Santander British Grand Prix just around the corner, Sky is launching a trio of limited edition designer Sky+ HD 1TB boxes to celebrate the Formula 1 season. 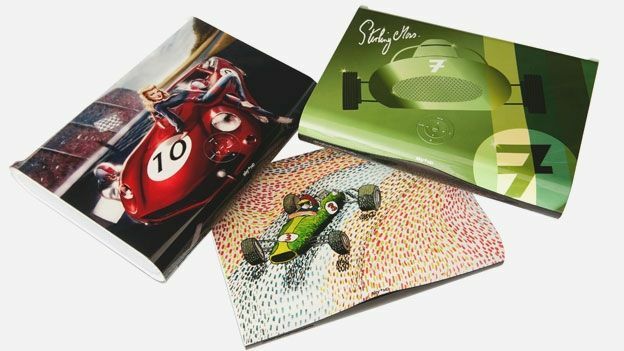 The boxes, designed by racing legend Sir Stirling Moss OBE and F1 fanatics Jodie Kidd and Vic Reeves, reflect the trio's individuality and perspective on the high-octane sport. F1 addicts can enjoy a season of in-depth coverage on the Sky Sport F1 HD channel, the only channel to offer live coverage of the whole Grand Prix season as well as every practice, race and qualifying session. “The idea for my design came from a car sculpture on the roof of my home which I designed myself, inspired by the racing cars from my era,” said Sir Stirling Moss. “The number 7 was a crucial element as it has always been a lucky number in my family… I'm quite superstitious so everything I can control will always revolve around the number 7. The 1TB box boasts a recording space up to 240 hours of HD content or 740 hours at standard definition. Available for pre-order now, existing Sky customers will be able to pick up one of the three limited edition boxes form £149. New customers will have to fork out £249 for an F1 themed box and a HD subscription. What do you make of the new F1 themed Sky+ HD boxes? Which of the three would you be most tempted to splash out on? Let us know via the T3 Twitter and Facebook feeds. Is this the year Sky Q ditches the dish, goes fully voice controlled and truly tailors its programme guide to you?